Its a big year in the house again... Daughter turns 16 an Son turns 18.. and I think to myself, where did time go?? I know I am not old enough for this.. but its true! 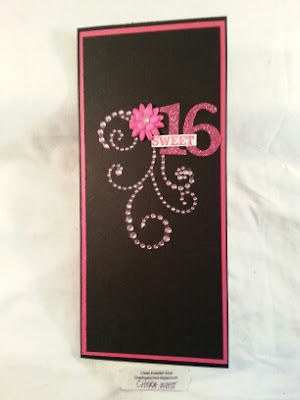 Therefore, we have many teens that are turning 16! One as early as May 3, which happens to be another special day in the house, as 1SG and I are getting married. This is why I better get a handle on some of these birthdays and cards! Todays card goes to a young lady whose celebration is PARIS inspired, with black & pink. 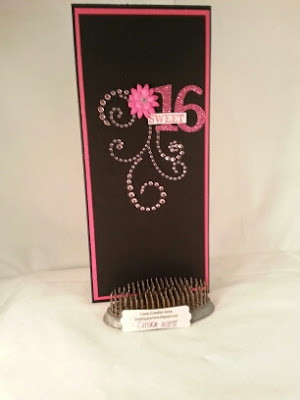 Bloggers Challenge is BLING IT ON, which actually the challenge is what inspired me to get a handle on the handful of Sweet 16's we have coming up in the next few months! The card is 4 x 9, a size I rarely ever make. this turned out beautiful, love the color choices! 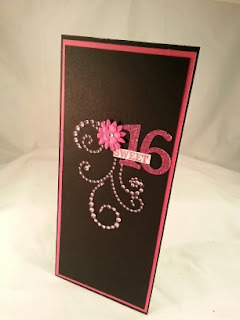 Fabulous card for a Sweet 16!